Amazing Adventures: What does "Awareness" get us? What does "Awareness" get us? ***I live in Australia. There are things that are common knowledge in The USA, where some of my readers, and a lot of my online friends live, that are little known here, even in the Autism Community. This post may contain information that a lot of my Northern Hemishpere readers already know, or even know more about than I do. If I have anything wrong, please let me know! I am trying to help my Australian friends discover some of the issues that exist so we can try to learn from others experiences and guard against replicating undesirable situations. Since 2007, April 7 has been the United Nations sanctioned World Autism Awareness Day. This year, UN Secretary General Ban Ki-moon said, "This international attention is essential to address stigma, lack of awareness and inadequate support structures. Now is the time to work for a more inclusive society, highlight the talents of affected people and ensure opportunities for them to realize their potential. " "Don't "light it up blue" in April! "Light It Up Blue" is an "awareness" campaign by Autism Speaks, an anti-autistic hate group dedicated to preventing the existence of people like me. If you take part in the "Light It Up Blue" campaign by displaying blue lights in April, or promoting the campaign with "Light It Up Blue" images and profile pics on Facebook, you're not doing anything to help or support Autistic people. Instead, you're showing support for a corrupt and bigoted organization that has a history of maligning us, silencing us, excluding us, and harming us. An organization that openly declares that its goal is to "prevent" us." 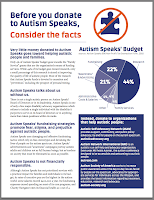 4% of their funds are spent on Family Services- that is the part that supports Autistic people. 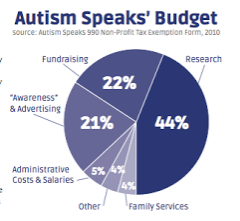 44% is spent on research.... that is a worry for an organisation that openly says they are " dedicated to funding research into the causes, prevention, treatments and a cure for autism" because when Autism is a part of who you are and how your brain works, the idea of the organisation claiming to be there to support you actually wanting to prevent or cure you is pretty scary really! Here is another link for those of you who have some time on your hands and want to do some more reading on this... https://en.wikipedia.org/wiki/Talk:Autism_Speaks/Controversy_links. There are some fantastic articles linked here that explain the controversy better than I could ever hope to. If you would like to know what many Autistic Adults think of the organisation that claims to speak for them and claims to be there for them, read this by Alyssa of Yes, That Too. Lastly, on Autism Speaks, if you want a really good, but short summary, The Caffeinated Autistic can help! Click here. Now, in Australia we don't have Autism Speaks (although they are conducting research here, and did happily back up and promote the Australian organisation Autism Awareness' efforts to "Light it up blue" this year), but we do have governments that are taking away disability support funding from schools, and we suffer our fair share of what I now think of as "tragedy talk" (examples?... Autism is a Tragedy.... 1 in 88 *suffer* from Autism..... Autism is an epidemic.... etc.) Daily newspapers report sensationalist stories, fuelled by newly announced statistics, and media statements by organisations like AS. On April 2 major newspapers ran stories written by parents of "children with Autism" about how hard life is living with Autism and how little support there is for Autistic people in our country. Some of these stories I found depressing as thy just talked about the hard stuff. A couple of them were good, and it was clear the parents were attempting to put out a positive message. But here is the problem with "Awareness": the media wants to tell the story so they can sell the story. They make people aware that Autism is hard by calling it a Tragedy, a Burden, a Struggle, and label it Heartbreaking. People will read that. The result of this is when I tell someone who doesn't actually know me or my family that 2 of my kids are Autistic they say [pause to put on compassionate face] "oh, I'm sorry. That must be hard" (or something similar). Which, although the person is responding in a way they feel is appropriate due to the information they have, is annoying because in our house Autism is not something to be apologised about. 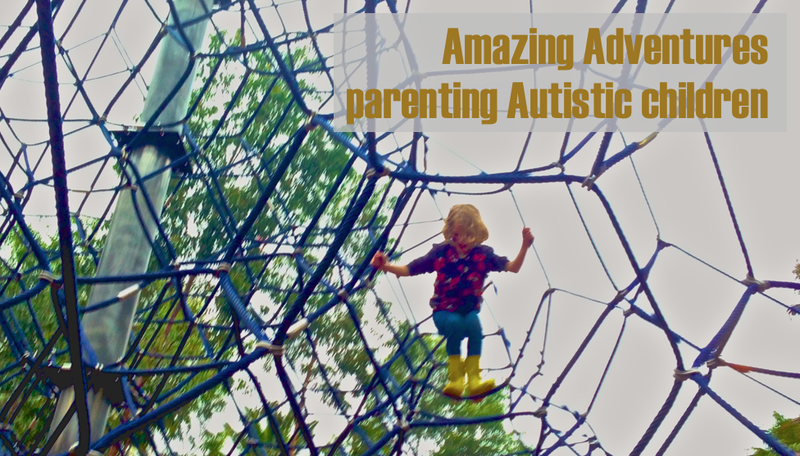 More important to acknowledge than my irritation as a parent when people apologise to me that my kids are Autistic is this- When Autism is presented as a burden, a problem, and a tragedy the result is that Autistic people suffer. Here is an example. On World Autism Awareness Day this year, ironically, an Autistic lady named Amanda was in hospital. She was being actively encouraged to consider NOT having a lifesaving medical procedure. You see Amanda is non-verbal and requires support to manage some of the tasks she needs to do daily so it was assumed that her life must be miserable and she would be better of considering allowing her life to end. Yes... really! Read here for more information about this situation. THAT is what "Autism Awareness" gets us. This is not an isolated incident, either. Last year an Autistic man called Paul was denied the right to go on a heart transplant waiting list because he is Autistic. You can read his story here. THAT is what "Autism Awareness" gets us. But that’s America you say. That wouldn’t happen here in Australia. Really? In 2012 an English family was denied entry into Australia to take a job that had been offered because their daughter is Autistic which you can read about here. THAT is what "Autism Awareness" gets us. In 2012 the NSW State Government removed Disability Support Funding from public schools resulting in most Autistic children in mainstream classes losing the support that was helping them succeed at school. You can read about these changes here. 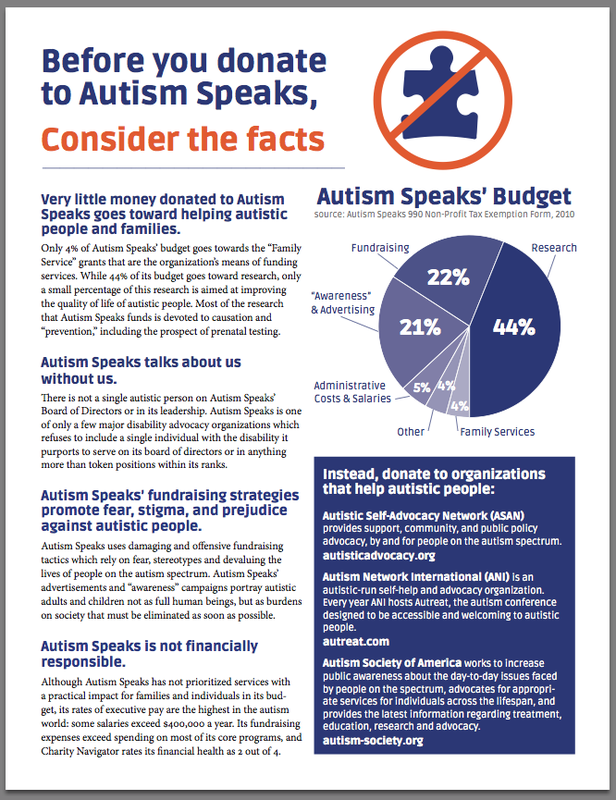 This change has impacted my family with both of my Autistic children now unable to receive funding toward providing them the support they found so helpful. THAT is what "Autism Awareness" gets us. As Genral Ban Ki-moon says, "Now is the time to work for a more inclusive society, highlight the talents of affected people and ensure opportunities for them to realize their potential. " Autism is a neurology. It is not an illness. It is not a disorder. It is a part of who a person is. You cannot cure Autism. You can use genocide against it. You can eradicate it. But you can't cure it. It is a horrifying thought to me that one of my Autistic children could be denied medical care that would be standard procedure for a person without a disability! It should be a horrifying thought to all of us that it could happen to anyone! Autistic people do not need more awareness. They need people to accept them as they are, as valuable people with the same rights as everyone else. We need to move towards acceptance of everyone, regardless of their neurology, so that all people receive the support, validation and recognition they need and deserve. You might say that I am just arguing semantics here. I would reply that I believe there is a very important difference between awareness and acceptance because of the behaviour that results from each. Awareness results in all sorts of knowledge, whether it be fact or fiction, that doesn't actually help Autistic people. Awareness is a good start, but not a solution. Nice post, but some links are broken. You might want to update when you get a chance. You can read my comment policy by clicking on the link at the top right of the page. © Michelle Sutton. This blog uses. Awesome Inc. theme. Powered by Blogger.